Cabin on White Water Toccoa River! That's right, when you stay at Reeves Roost you'll also agree. Dense woods provide privacy and an intimate setting for your complete satisfaction! Quaintly located on the Toccoa River in the center of the Aska Recreation Area, with beautiful scenic views, you can enjoy everything the river has to offer: swimming, fishing, and our favorite, tubing from right in front of the cabin. Along the river and at the base of our cabin lies a green field decorated by colorful wild flowers a fire pit ,hammock, dinning table and swing. At night, fire flies and stars light up the sky. Sorry, pets are NOT allowed. Relax in one of the many swings, rocking chairs, or hammocks on the porch, which is nestled high amongst tall pine trees. Plenty of trails are located in the bordering Chattahoochee National Forest, including the Appalachian Trail. Other activities nearby include horseback riding,zip lining, multiple golf courses, whitewater rafting, trout fish hatchery, water falls, and antique shopping. Nearby towns are Blairsville, Blue Ridge, Dahlonega, Elijay, Helen, and Dillard. We would love for you to come and enjoy our cabin as we have for so many years. See why our renters come back year after year. We are both third and forth generation Tampa natives. We both are retired and enjoying every minute of it. We now live on a large ski lake in Land-o-Lakes,Fl. just north of Tampa . We vacation in the area in the area in a small travel trailer with our two sons and fell in love with area. We then started looking of a lot on the river to build our cabin. We now spend more time with our grandkids and love it as much as we do. We love the solitude, fireflys, deer, the sounds of the river, dinning on the porch and rain on the tin roof top. Cabin was exactly as described. Off the beaten path but definitely worth it!!! Best part is the sounds of the river down below. Would recommend to anyone and would love to come back in the fall. Thank you Jim for sharing your cabin!!! rustic mountain stay, great views. We had a wonderful time at the cabin, the views of the mountains were so beautiful, and we loved the little birds that came to the feeder. The weather was a little rainy on our second day, but we still enjoyed it. The cabin was very well maintained, the only aspects that could be improved were some cobwebs near the beds upstairs, and there was only instant coffee. Also, be sure to get everything you need in town before you get to the cabin, because it is really up in the mountains. ( It's our first real cabin stay so we found this out the hard way ;) But all in all the stay was wonderful, I wish we would've booked for one more day because there it is just so beautiful up there. I would definitely recommend this cabin. It was lovely. If you want to get away from the hustle and bustle of the world, reserve the quaint cabin in the woods by the Toccoa River. The environment is very peaceful and scenic with wildlife (deer and turkeys) and serene sounds of whitewater from the nearby Toccoa River . The cabin has all the amenities one would need including WIFI. Beautiful cabin and view. Our stay was perfect fun!!! 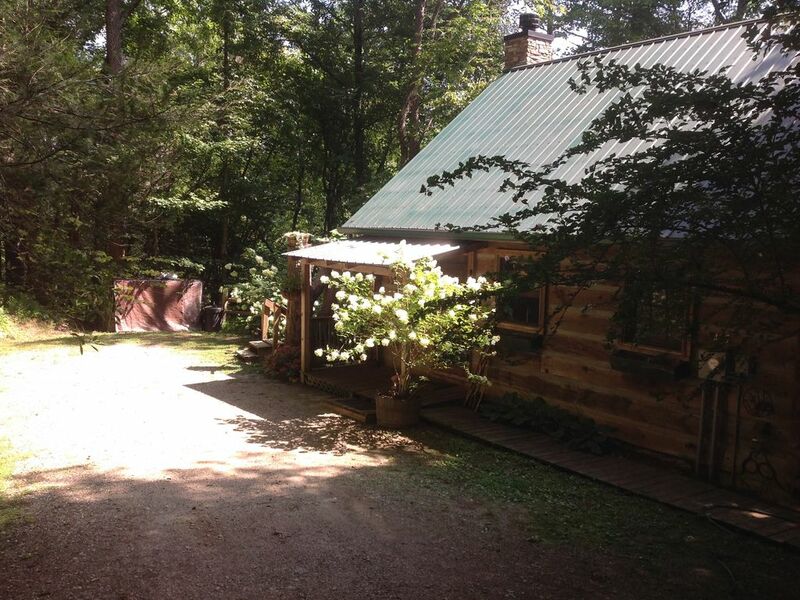 The cabin & its location was just what the doctor ordered for our family. Plenty of good hiking trails around and some fun shopping in Blue Ridge, just a short drive away. Cabin kitchen had everything we needed to prepare meals and beds were comfortable. Ping pong table got some serious use on a rainy afternoon and every night after dinner. Charming place. Would visit again. So glad you enjoyed your stay ! The Ping Pong table does get a work out on rainy days and the porch rockers as well. The large numbers of birds are starting to come back to the feeders. The Hummingbirds are also back as well. I have a hard time keeping the feeders full. From the minute we walked in we felt at home- beds were comfy- water pressure in the shower was AMAZING- it rained and snowed the whole time we were here so we didn’t get to explore outside at all but the porch was very comfortable and lots of seating choices. The basement stairs are steep so I didn’t go down there but my husband did and said it would be a great place for the kids to hang out. The owner called the second day to check on us and offer suggestions of places to go in town- I thought that was very nice of him. We had a nice weekend getaway and hope to come back in the summer when we can take advantage of the vast outside area. Thank you Jim for letting us stay at your cabin! Thanks for the kind review !Sorry about the rain but you are lucky to see snow. You don't know how many guess come hoping to see snow and don't. Please come back soon and hope the sun shines on you all weekend long. There is no refund if cancellation is less than 14 days. Arrangements for personal checks must be made at least 30 days in advance of arrival.